Today, consumers are interested in information about ingredients on food labels and other health-related data. While grocery shoppers continue to seek tasty, nutritious and safe food, the impact of food labels appears to be waning, according to Mintel’s Food Packaging Trends: Spotlight on Food Labeling report. In 2015, less than half of U.S. consumers indicated they “usually read” the information on product labels, and the percentage of consumers who indicate doing so declined in the several years prior. So just what are consumers looking for on food labels? Seventy percent of grocery shoppers look for ingredients listed on food packaging. Such a high response rate is a clear indication that positioning key or functional ingredient information prominently on pack should be a priority for brands. Whereas many foods touting their healthy attributes have been accentuating what could be termed a value-add (such as added protein, fiber and omega-3s), consumers are more likely to equate healthy with “natural,” “clean” and what they would describe as “real” foods, according to the report. On-pack messaging that helps this next generation of shoppers navigate healthy food choices will be paramount to driving future sales. Two thirds of grocery shoppers who prioritize low price look for the expiration date on food items, and 55% of this group looks for brand. Such factors appear as cost savers for those who are conservative about food spend, assuring reliable products that will not spoil before they are used. Generationally, younger shoppers are much less likely than older ones to rely on ingredients lists. Instead, they seek the assurance of product descriptors, such as “natural” and “organic.” Mintel’s Free-from Food Trends report finds the interest in a healthier lifestyle is particularly compelling to Millennials with families, and a number of Millennial parents are heeding the advice of healthcare professionals to eliminate certain ingredients from their diet. Nevertheless, among Millennial parents who purchase foods bearing a “free-from” claim, that purchase decision is largely fueled by an interest in avoiding what they regard as unnecessary ingredients, rather than what’s included. A quarter of the oldest shoppers Mintel measured say on-pack brand/product history is unnecessary. In contrast, iGen/Millennials are more likely than other generation groups to say this information is important, influential and trustworthy. Mintel’s Marketing to US Millennials report finds that, though Millennials never forget they are being sold to, they are willing to set cynicism aside when they perceive companies are sincere. Brands that resonate with Millennials are often those that incorporate values into their corporate identity. Such a response is an indication that story may play a larger role in food sales moving forward, especially for this demographic. Seals and third-party certifications from organizations lead on-pack indicators for trustworthiness. A trend Mintel has identified as the Decline of Deference discusses that distrust of business and other institutions has soared to all-time high levels, creating fertile ground for creative disruption. Seals that appear to vouch for a product from an outside source, rather than requiring shoppers to take the manufacturer’s word for it, can be considered trustworthy. Natural positioning is of interest to those who seek high-quality products, as well as to those who are interested in food safety. Ingredient source information also appears useful to those for which food safety is a driving purchase factor. According to Mintel, more than half of grocery shoppers say nutritional panels are informative, and a third say these influence purchase. This is a strong indication of the power of this labeling element. However, only 25% of grocery shoppers think nutritional panels are easy to understand. Product manufacturers may want to engage in a “what does this mean” effort, where some lesser-known nutritional values and ingredients are clarified. Less than half of iGen/Millennials say Nutrition Facts panels are informative, and less than one third say they influence their food purchase. While regulations require this information to be included on-pack, resonating with future generations of shoppers will require further efforts. Recent changes to the Nutrition Facts label found on food packages in the U.S. are aimed at reflecting how people eat and drink today, according to the FDA. However, Mintel’s packaging analyst team believes the SmartLabel mobile initiative (smartlabel.org) may be a more modern and and effective means to communicate with today’s mobile-savvy shoppers and consumers. SmartLabel was created by a group of consumer companies and retailers formed by the Grocery Manufacturers Assn. and the Food Marketing Institute’s Trading Partner Alliance (TPA). SmartLabel connects consumers, via mobile devices, to food and household product information—from ingredients to nutritional information to allergen facts to third-party certifications. SmartLabel even includes a quick-access glossary of terms, making it possible for consumers to really understand what’s behind ingredients. SmartLabel even makes it possible to contact participating companies directly with more questions. More than 30 major companies—including Hershey, General Mills, Campbell Soup and Unilever—have already committed to using SmartLabel and the number of products providing ingredient information in the consistent SmartLabel format will continue to grow to more than 34,000 by the end of 2017. This article was written by David Luttenberger and Beth Bloom. Luttenberger is the global packaging director at Mintel. He has 24 years’ packaging experience. He can be reached at dluttenberger@mintel.com. You can also follow him on Twitter at @packaginggeek. Beth Bloom is a senior food and drink analyst at Mintel. When it comes to aiding in purchase decisions, the oldest shoppers are most influenced by the Nutrition Facts information on food and beverage packages. Banners/informational „call-outs,“ as well as seals/certifications, on a package help influence shoppers to buy. Recycling is nice, but some shop owners are trying to eliminate waste altogether. 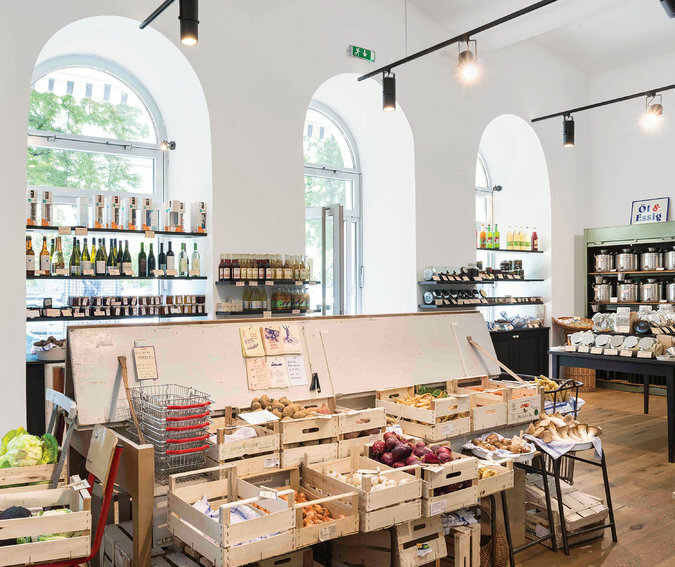 THE SHOPPERS AT Original Unverpackt, a food market in the gentrifying but still gritty Berlin neighborhood of Kreuzberg, arrive largely by bicycle, carrying mesh totes and burlap sacks. Along one impeccably organized wall, they lift the spouts of gravity bins to let grains, nuts or legumes tumble into the tins and jars they’ve brought along. At the bulbous stainless steel fusti, they dispense olive oil, balsamic vinegar or soy sauce into glass vessels. A customer samples a Medjool date, but looks confused about what to do with the pit — there are no napkins, no trash cans — and ends up stashing it in her pocket. She is, after all, shopping at a store committed to zero waste. Designed by the Los Angles-based architect Michael J. Brown, a disciple of Daniel Libeskind, the shop is a particularly sleek and modern manifestation of precycling, the concept of eliminating trash before it is created. If you don’t use new plastic, paper or metal to begin with, you won’t have to dispose of it. When Judit Vidal and Iban Àlvaro opened the first of their 12 Granel (Spanish for ‘‘bulk’’) stores in Spain, their backgrounds in scenic design (her) and architecture (him) helped reinvent the look of bulk shopping. The bins of caramels and quinoa and arrangements of olives and honey are at eye level, essentially advertising themselves, their actual shapes and colors replacing photos on packages. Stepladders let young customers participate, while the grown-ups reacquaint themselves with weights and measures to buy exactly what they need from pale wood coffers under powder-coated industrial lamps. PRECYCLING OFFERS a secondary reward as well, by making us re-see what we’re looking at. Most packaging hides the good stuff, but there’s no hiding the gorgeous greens and golds of the olive oil varietals poured from big blown-glass teardrops at the French bulk shops Day by Day. There is nothing hippieish about any of their nine markets: Some resemble Candyland, all primary colors under dancing glass mobiles; others are almost monastically white. This more thoughtful way of shopping does require some adjustment. Original Unverpackt owners Milena Glimbovski and Sara Wolf must occasionally explain that the canister of white pellets contains chewable toothpaste — no carton, no tube — or that the ‘‘mooncups,’’ which already have a passionate fan base, are tampon alternatives made of medical-grade silicon. But they, like proprietors of similar stores, say that the size, shape and consistency of virtually any product could be altered to fit the zero-waste model. 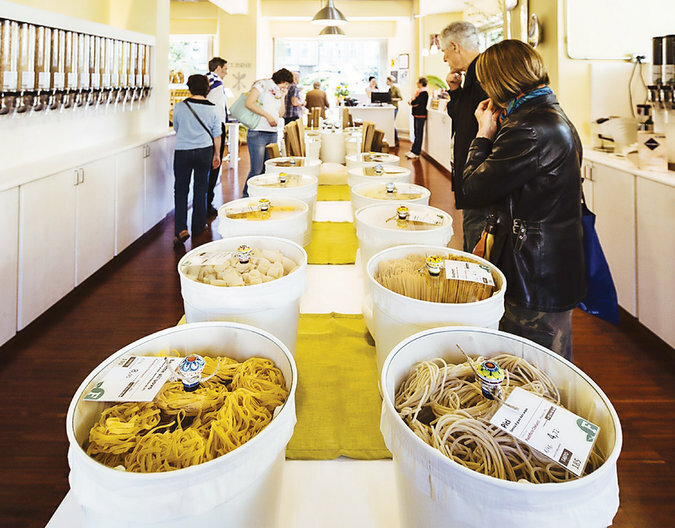 At Italy’s Effecorta locations (which means ‘‘short chain’’: a jibe at big supermarkets), shoppers use disposable plastic gloves to grab fistfuls of spaghetti from glass-domed containers, or scoop smaller shapes with ladles. Rethinking and reinventing groceries in the interest of the environment would require the cooperation of manufacturers, as well as consumers. Americans are like the Felix Unger of the retail economy, with a reputation for fastidiousness — that’s why so many products are packaged and shrink-wrapped in layers of protection: Nobody’s touched those coffee beans since Juan Valdez grew them. But we weren’t always so persnickety; we used to buy pickles or crackers or penny nails from bins. Big Grocery, like Big Pharma, might argue that packaging provides 21st-century security, and that precycling on a grand scale is impractical. Not true, say these European shopkeepers: Their places are updating the old American general store cracker-barrel approach, while making hygiene a priority. So is America ready? Denver is about to find out when it gets Zero Market, co-founded by Lyndsey Manderson, a former high-school science teacher, whose new store will be located inside an old aviation hangar and will resemble a modern apothecary. The walls will be covered with reclaimed barn wood that’s been sanded and waxed. Rolling ladders to access higher shelves will make shopping a bit of a joyride rather than drudgery. 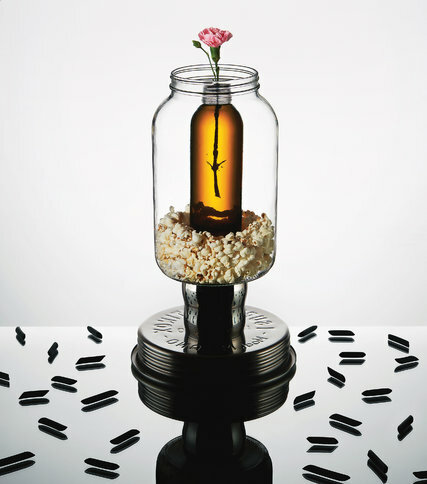 Amber- and clear-glass jars will be painted with chalkboard labels so the contents are both evident and inviting. ‘‘We’re asking people to slow down when they come to the store and take time to figure out how much they need,’’ said Manderson. ‘‘And we’ll have a tracker that will let them see the amount of packaging that’s been diverted from landfill.’’ How long, then, until Brooklyn catches on? Packaging has long been more than a simple container or wrapper for a product that protects it. Today, it’s become something of an art, centred on making the item attractive for buyers. And sometimes things are packed up so nicely that you already want to buy them before you’re even sure you can make use of the stuff inside. Today we at Bright Side have prepared a collection of some of the most awesome packaging designs we’ve ever seen. Each one makes the products it contains almost irresistible. Is Your Product on the Path to Iconic? 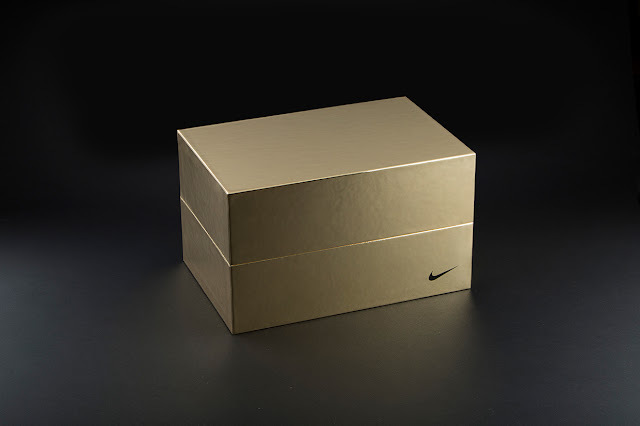 Does Your Product Packaging Design Help Elevate Your Brand to Iconic Status? You know icon when you see it. Brands such as Coca-Cola or Tiffany & Co. are hard to miss. How have classic brands managed to create product packaging designs that just about anyone can recognize? Creating an iconic brand takes careful work and dedication. 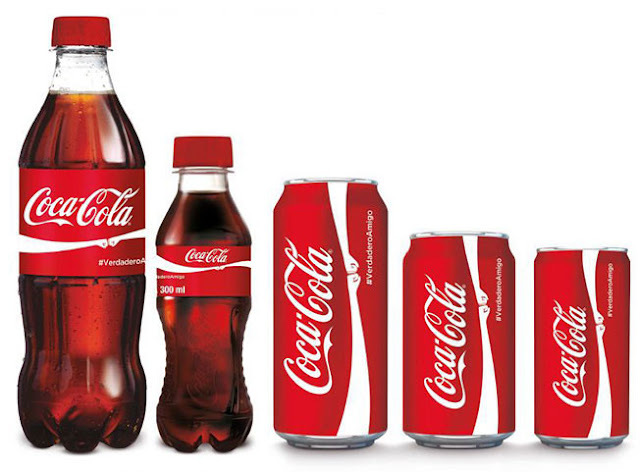 Often a customer’s first interaction and connection to a brand, packaging plays an essential role in supporting a brand’s path to iconic status. Poorly designed or planned packaging can hinder the success of an otherwise great product. So, how do you know if your new product packaging design has what it takes to become an icon in one, five, or 10 years down the road? To ensure your packaging is memorable and sets your product apart from the crowd, consider implementing the following proven elements that have helped create iconic brands. Memorability Is your packaging design memorable? If you consider any major brand, such as the Coca-Cola red, the Nike Swoosh or McDonald’s Golden Arches, it’s hard for anyone not to remember them. A definite sign that your brand is designed to be iconic is the presence of strong, powerful visual cues. Regardless of your product, visual cues that stay in people’s minds are a key first step for developing iconic status. You can achieve strong visual cues through deliberate printing and finishing elements on your packaging including PMS colors, specialty coatings, press effects, embossing, debossing or foils. By focusing on these strong visual elements of your packaging, you create a focal point for consumers, making your brand, product and packaging easy to remember. Many of the brands we consider iconic are the simplest we know. Take Nike and Apple as examples. Rather than obscuring their strong branding with too many effects, designs are simplified and clean. While your packaging should reflect your brand’s status and appeal to your market, it’s important to not overdo it with too many bells and whistles that can detract attention from your branding or confuse consumers.Keeping your packaging simple and focused allows you to highlight the most important elements of your brand. Aesthetically speaking, too many specialty effects can clash and result in a confusing message to consumers. Choose the most important aspect of your brand and highlight this through your packaging. The consistency between your marketing, branding and packaging will resonate better with consumers. Packwood е сред първите фирми в България, специализирана в производството на опаковки от крафт картон и хартия за страната и чужбина.